The Golden Star offers cheap accommodation at 150 meters from the main square of Fira, close to all tourist services and public transport. 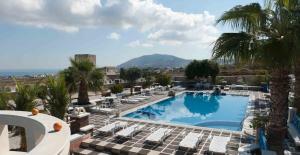 It has an outdoor pool with hydromassage and a sun terrace with sun loungers. Featuring a private balcony with sea views, this air-conditioned room includes a flat-screen satellite TV and a small refrigerator. Free Wi-Fi access is available.